EASTER WEEKEND AT TWELVE RESTAURANT! 2 -4 - 1 Cocktails on Friday and Saturday evening from 7pm until 9pm. A la carte and seasonal spring market menu available. Enjoy a relaxing Sunday Roast at Twelve Restaurant on Easter Sunday. 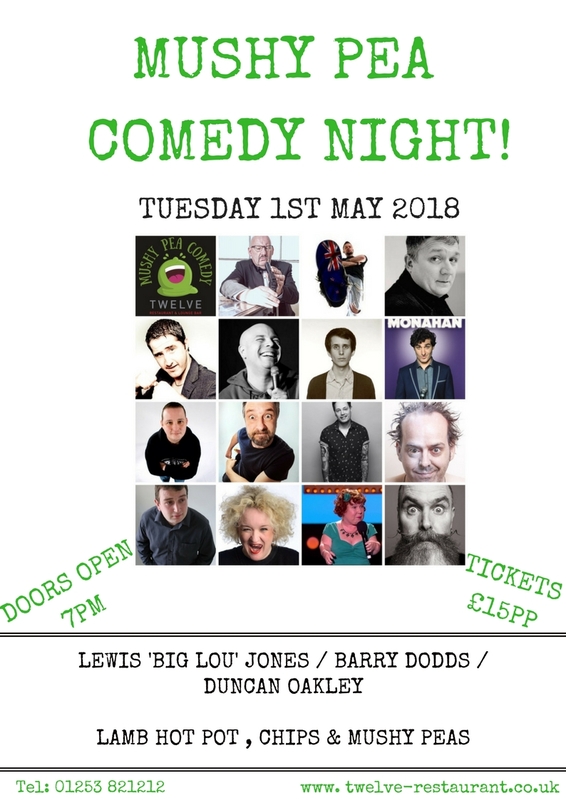 ENJOY COMEDY THIS MAY FROM SOME OF THE BEST ACTS ON THE CIRCUIT…THERE IS NO BETTER PLACE TO WATCH IT THAN TWELVE RESTAURANT! BOOK YOUR TICKETS TODAY BY CALLING 01253 82 12 12! CELEBRATING 19 YEARS OF TWELVE THIS MARCH. ENJOY OUR SPECIAL 3 COURSE CELEBRATION MENU ON A TUESDAY, WEDNESDAY AND THURSDAY EVENINGS FOR ONLY £19 PP. 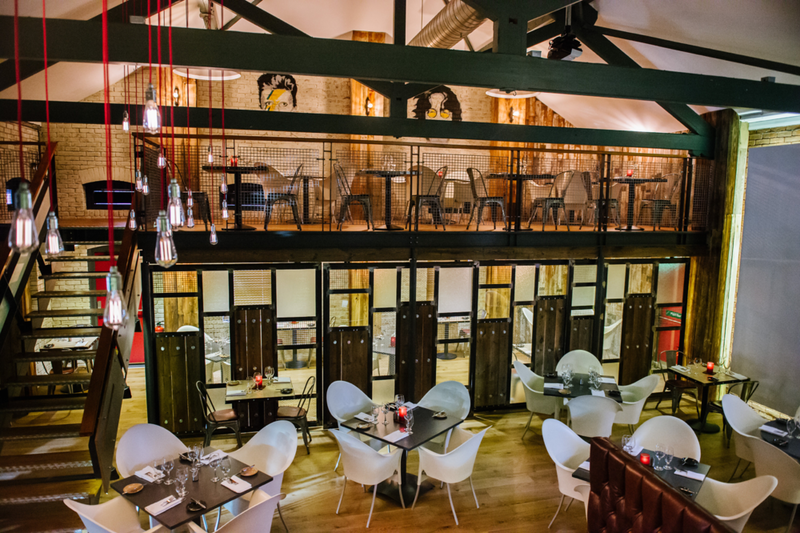 TREAT YOURSELF AND YOUR LOVED ONE TO A 3 COURSE VALENTINES MENU + COMPLIMENTARY COCKTAIL ON ARRIVAL. Join us this October for a month of live entertainment! We have a fantastic new line up of artists who will provide fantastic background music while you enjoy drinks or dinner with us. No tickets required but booking recommended when dining! 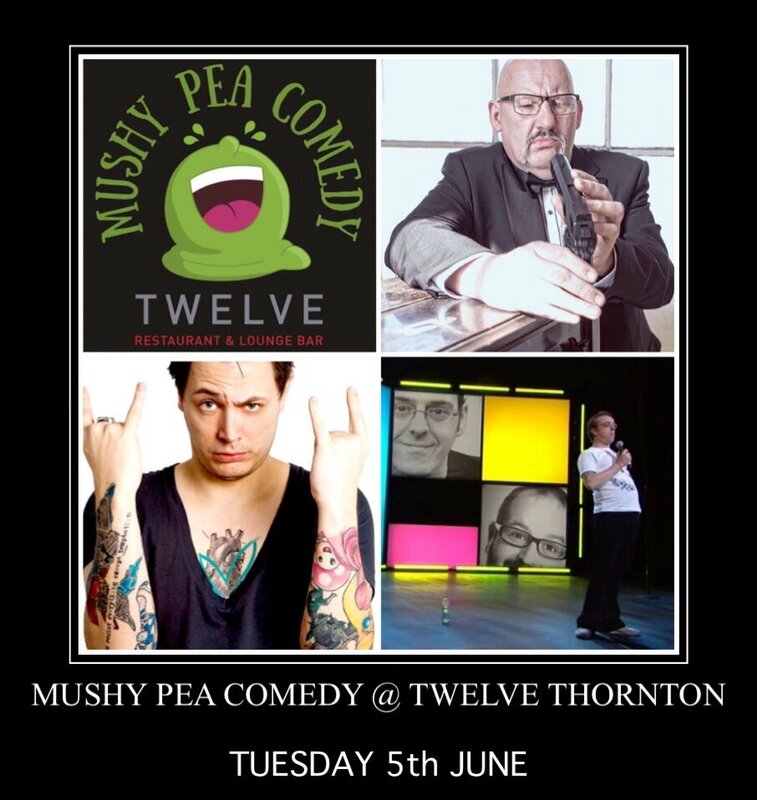 TWELVE’S MUSHY PEA COMEDY EVENINGS ARE BACK! This July we will be joined for the FIRST TIME by Lancashire Band 'The Hustle' for an evening of live entertainment and fantastic food. 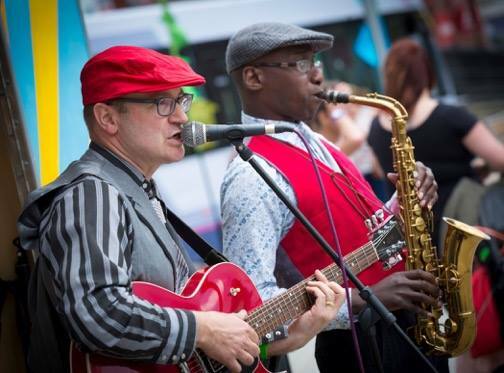 The Hustle are a local band who play a mixture of classics and floor fillers that will get you in the dancing mood! 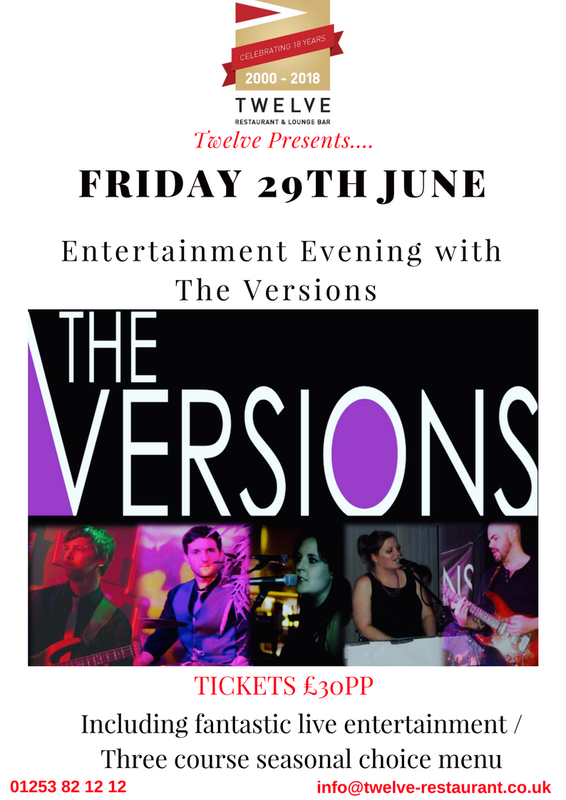 Tickets are priced at £30pp including live entertainment and an exquisite three course seasonal choice menu. Don't miss out. Call 01253 82 12 12 to reserve your place! TREAT YOUR DAD...SUNDAY 17TH JUNE! 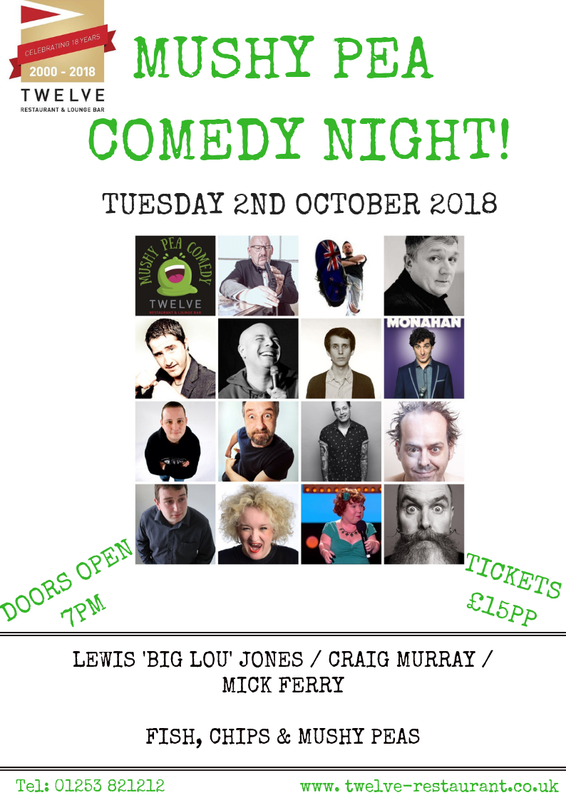 LAST COMEDY EVENING UNTIL OCTOBER! 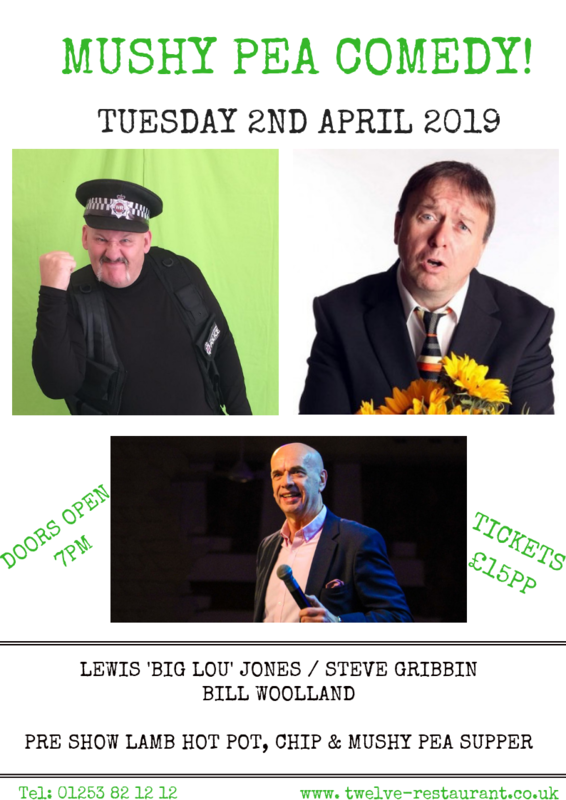 Bringing the best acts from the comedy circuit to the Fylde Coast. -Seymour Mace (best known for playing Steve on the BBC Three comedy Ideal). Tickets £15pp including pre show meal of fish, chips & mushy peas. Book Now: 01253 82 12 12. 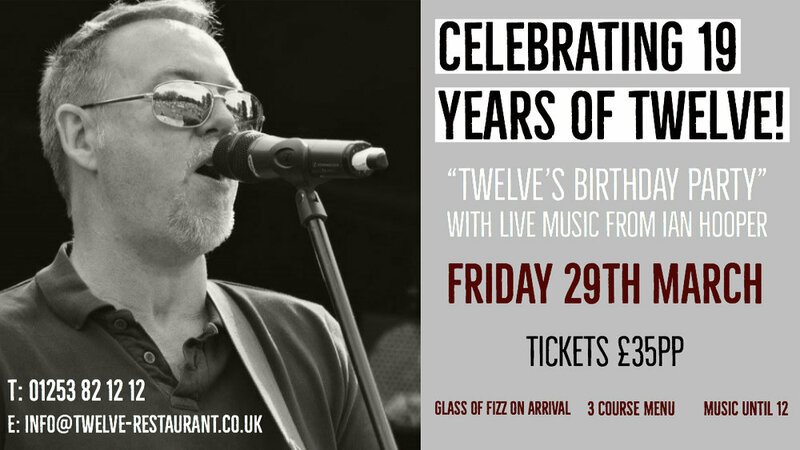 Local favourites and friends of Twelve; The Ian Hooper Band are performing live at Twelve this April! 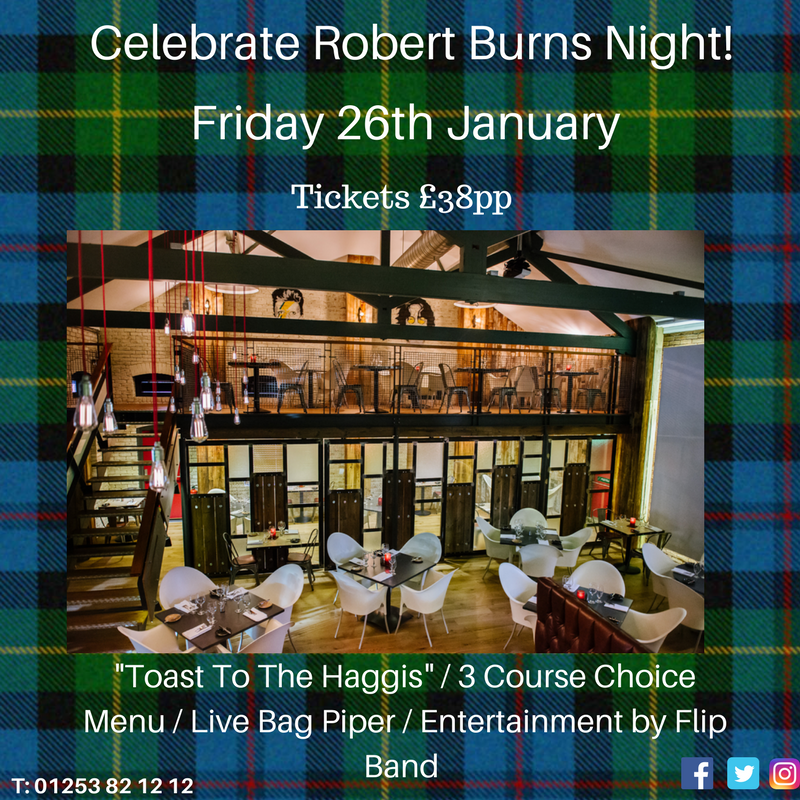 Tickets £35pp including three course choice menu. Celebrate Twelve's birthday month on Friday 23rd March.... Live entertainment from a Bob Marley Tribute Band! Tickets £30pp and also include a choice 3 course menu. In celebration of Twelve's 18th birthday this March we are hosting a series of special events. Join us for an evening of delicious food and fantastic gin from one of the finest distilleries in the North West...Black Powder based in Weeton, Singleton! Tickets for the evening are £45pp and will include a talk from one of the founders of Black Powder Gin; Anthony Dallas. We will be serving a 6 course small plate menu. You will also receive a Twelve Boar gin cocktail on arrival and 4 accompanying Black Powder gins throughout the evening. Arrival drinks between 7pm and 7:30pm. Limited availability. Book now by calling 01253 821212! 6th March: CELEBRATING 18 YEARS OF TWELVE WITH....Dave Twentyman & Vince Atta. Tickets include a pre show hog roast supper! MC: Lewis 'Big Lou' Jones. Closing: Smug Roberts who has performed in Phoenix Nights and Mrs Browns Boys. Treat yourself or someone you know to a special cookery demonstration at Twelve Restaurant in 2018. We have very limited availability for the two dates: Wednesday 31st January and Wednesday 21st February. Tickets are £70pp and include a copy of the North West Relish Publications Cook Book 2018. You will also learn top cooking tips from our team of award winning chefs, and a three course lunch with accompanying wine. To Book or enquire please call: 01253 821212.